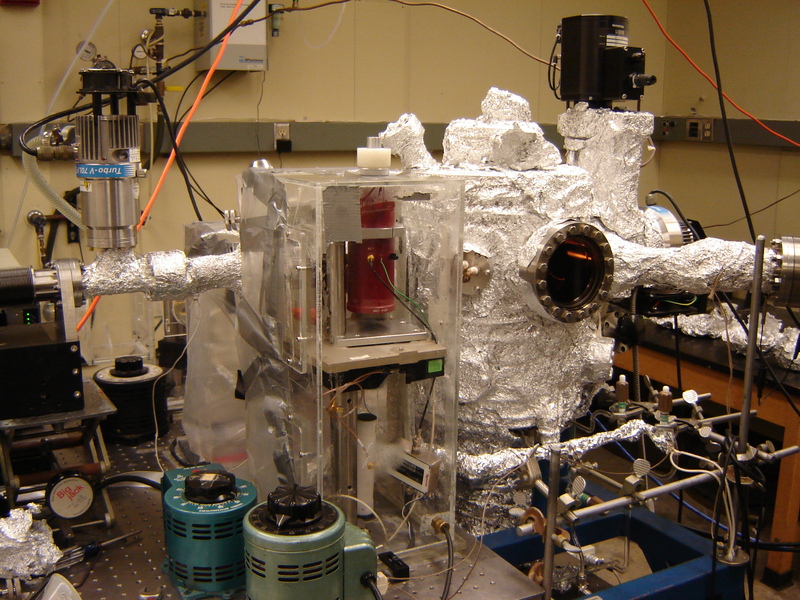 This ultrahigh vacuum chamber is used to collect infrared spectra of monolayers adsorbed in single crystal metal surface (reflection-absorption infrared spectroscopy). It also contains a cell based on a six-way cross, which is used as an infrared analysis chamber for collecting reflection-absorption infrared data. The cell is isolated from the main part of the chamber by means of a gate valve and allows experiments to be carried out for surfaces in the presence of high pressures of gases. Reflection absorption infrared spectra (RAIRS) are collected using a Bruker Equinox spectrometer. Light from the spectrometer is steered onto the sample at grazing (80 degrees) incidence and the reflected light is focused onto a liquid-nitrogen-cooled, mercury-cadmium-telluride (MCT) detector.